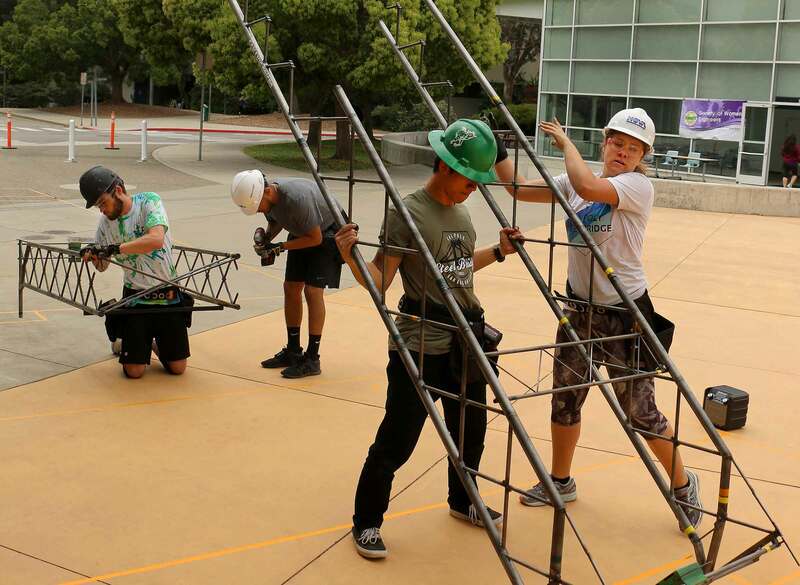 SAN LUIS OBISPO — A team of Cal Poly civil engineering students placed second in the National Student Steel Bridge Competition at the University of Illinois — marking the eighth consecutive year Cal Poly has placed in the top 10. After taking first in the regional competition in April, the Cal Poly team competed against 41 other schools from around the world in the nationals hosted by the University of Illinois Urbana-Champaign on May 25-26. A team from Lafayette College in Easton, Penn., won the contest, while Montreal’s École de Technologie Supérieure, which had won back-to-back national titles in 2016 and 2017, came in third. The national contest, testing teamwork and project management, challenges students to produce a scale-model bridge that satisfies requirements in several categories, including construction speed; lightness; display; stiffness; economy; and efficiency. The Cal Poly team also placed in the top six in each of those individual categories. The team began working in August to plan, design, fabricate and construct a 1:10 scale model steel bridge, said project manager Michael Clark. In the winter quarter, initial welding began, and in spring the team practiced construction three times a week for a total of 200 repetitions. “In practice, we achieved a record two minutes, seven seconds build time,” said Clark, a civil engineering senior from Sebastopol. During the competition, the team was fifth with a time of 3:07 — 10 seconds faster than Lafayette College. The Cal Poly Steel Bridge team consists of undergraduate civil engineering students. This year, the competition was a senior project for the six senior captains. While four builders actually constructed at the nationals, the Cal Poly team took 16 members so they could study the competition. The builders, all seniors, were: Jonathan Espinoza of Pittsburg, Calif.; Allen Lactaoen of San Luis Obispo; Luke Nazaroff of Escondido, Calif.; and Sarah Shaffer of Ventura, Calif.
“The 12 additional students are there to ask questions, take pictures of connection ideas and videotape construction runs,” Clark said. While that will help students compete next year, Clark said the contest also helps prepare students for further challenges. “That experience translates well to recognizing constructability problems in our professional careers,” Clark said.